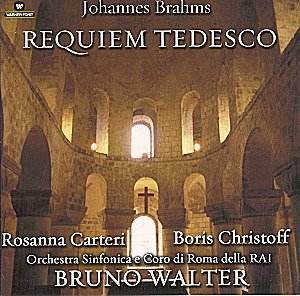 When I was offered the chance to review a CD of a live performance in which Bruno Walter conducts the Brahms Requiem I was excited. Walter was a splendid Brahms conductor and the work in question is one that I love very much and in which I have sung several times. Alas, the reality proved to be much less enticing than the prospect. It was something of a surprise to find that the performance is sung in Italian. I suppose that the Italian Radio authorities reasoned that listeners would understand the work more easily in their own language � though in fact the choral diction is often so indistinct that it�s a struggle to make out what language they are singing in. But there is a bigger issue. The work sounds completely different. Phrases such as �Aber des Herrn Wort bleibet in Ewigkeit� can�t easily be replaced by �Verbo divino resta nell� eternità.� It sounds all wrong and gives the music a completely different timbre and character. Incidentally, during this review I�ll stick with the German words, as that will be how most readers will know the work. A note in the booklet reads as follows: "Maybe a certain lack of technical quality in the recording (mastered for the first time [in] 1981) could affect the listening, nevertheless its extraordinary historical and artistic value can widely exceed any other consideration." Well, I fear this special pleading is not justified. The recorded sound is not particularly good. There�s a tendency to overload in louder passages and when the choir is singing it�s usually quite hard to hear the orchestra. Sadly, I can�t agree that the performance is of such quality as to justify tolerance of the sound. Walter�s interpretation is basically fine. There are one or two instances where I�m a little uncomfortable with his choice of tempo but overall it�s a satisfying and �central� interpretation. For the most part the orchestral contribution, when it�s audible, is satisfactory, though not much detail emerges, and Walter seems to manage to get the players to attend to dynamics. No, the problem is the singing, I fear. The choir is absolutely crucial in this work as they carry the bulk of the argument. The opening phrases don�t augur well. The choir produces a woolly sound, often seeming to swoop upwards to notes. There�s also a tendency to wallow expressively. There�s no brightness to the choral sound. In short the singing is nowhere near incisive enough. Sadly, this proves to be all too typical of the standard of much of the singing that is to come. In the second movement, the very first choral entry, �Denn alles Fleisch es ist wie Gras� is marked piano in my score. At best this choir manages mezzo forte. This means that when the same music returns marked forte the all-important contrast goes for nothing. Later in the same movement the long passage beginning �Die Erlöseten des Herrn� fares a bit better. The singing is sturdy and these pages confirm an impression that the choir is better when singing the louder passages. However, in the following movement the big fugue, �Der Gerechten Seelen sind in Gottes Hand� is poorly executed at an unvarying forte with the orchestra all but inaudible. I�ve written the words "just an aural soup" in my listening notes and I don�t think the recording is wholly to blame. This is just the sort of performance standard that has given the work a bad name in some quarters. It�s not an easy passage to bring off for it can sound tedious unless the performers admit some light and shade into the music. It�s tedious here. Rather surprisingly things improve somewhat in the fifth movement. Soprano soloist Rosanna Carteri has a fine voice and she sings intelligently and well, even if hers isn�t the ideal type of voice for this music. Her singing is expressive and eloquent without going over the top. I don�t know whether she inspired the choir but their singing is much better here. There�s a welcome sensitivity and good attention to detail. From here on the choral singing is better. In the next movement there�s a proper bite to �Denn es wird die Posaune� and in the big fugue, �Herr, du bist würdig� the choir is splendidly fervent, singing incisively at last. They�re also good in the final movement, imparting, for example, a proper sense of mystery to the hushed �Ja, der Geist spricht.� Sadly, as Bruno Walter brings the work to its quietly reflective ending the audience erupts into wholly inappropriate and fervent applause before the last note has died away. I normally approve of the retention of some applause after a live recording but this is an abuse � though in fairness it would have been impossible to edit out the ovation. I haven�t mentioned the other soloist, Boris Christoff. His performance will not be to all tastes. He�s darkly imposing and, of course, he has a voice of fabulous depth and richness. However, I don�t think it�s simply the fact that he�s singing in Italian that made me think more than once that the Grand Inquisitor was on the platform. This performance is almost an example of a "game of two halves." The standard of performance does rise appreciably for the last three movements. However, by then it�s too late. I fear I can�t endorse at all the claim that this performance has "extraordinary historical and artistic value." In fact, I�d say it does nothing to enhance Bruno Walter�s reputation as a Brahmsian. This issue is completely uncompetitive, I�m afraid, and this is one archive performance that should have been left to gather dust on the shelves.